I am writing my first race report with the expectation that many of you who are reading it are not familiar with ultras. If this is not the case, this probably has more detail than you would want to read in a normal race report. However, this is my first 100 and I hope to convince some road runners I know to get out and experience the beauty and challenges of running on trails… maybe even an ultra! Why sign up for one of the most challenging 100 Mile races on the other side of the country for my first century? I was introduced to the 100 Mile distance when I paced my good friend Bobby “Goat” Weinhold for the last 38 miles of his first 100 Mile race, the Mohican in June 2010. The experience of running in the mountains, pushing yourself through the night, and the amazing warm and supportive people who make up the ultra community got me hooked on the idea to run one myself one day. I ran my first 50 miler last year and wanted to run my 1st 100Miler this year. I had already signed up for the Wineglass Marathon in September and Chimera was the last race in 2012 that would allow me the most time to prepare following the marathon while testing me on a challenging and beautiful course. 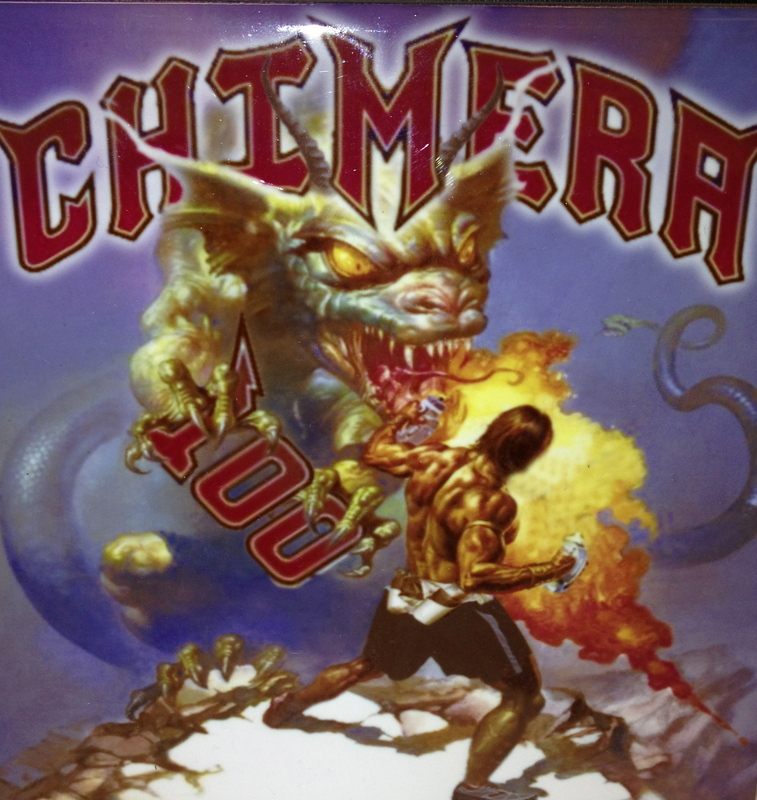 Based on this timing, most of the training for Chimera was very similar to my marathon training through the end of the September. After the Wineglass Marathon on September 30th and a new personal best of 2:54, I felt great and took a few days off. Following this very short recovery, I started running with the Goat and began logging over 100 miles per week on the road and on trails for the following 3 weeks before starting my second taper leading up to Chimera. While everything was going well for me, the Goat unfortunately developed Tibial fasciitis and was placed in a boot 2 weeks before my race. This was disappointing for both of us as he was supposed to pace me for the last 40 miles. However he would still be coming out with me and I knew I would have one of the best crews out there meeting me at select aid stations (A/S) with supplies I would desperately need. We arrived late Thursday night and checked out the starting area on Friday morning so we would know where to go the following day. Our pre-race meeting was different from what most of my road racing friends may be used to. No “expo” at Hell’s Kitchen Bar but rather the RD and group of fellow runners/ volunteers handing out race goodies and providing answers to the many questions I and others had. John H, Jack and other local runners instantly made me feel welcome as we shared the common bond that we would be suffering together in less than 24 hours. 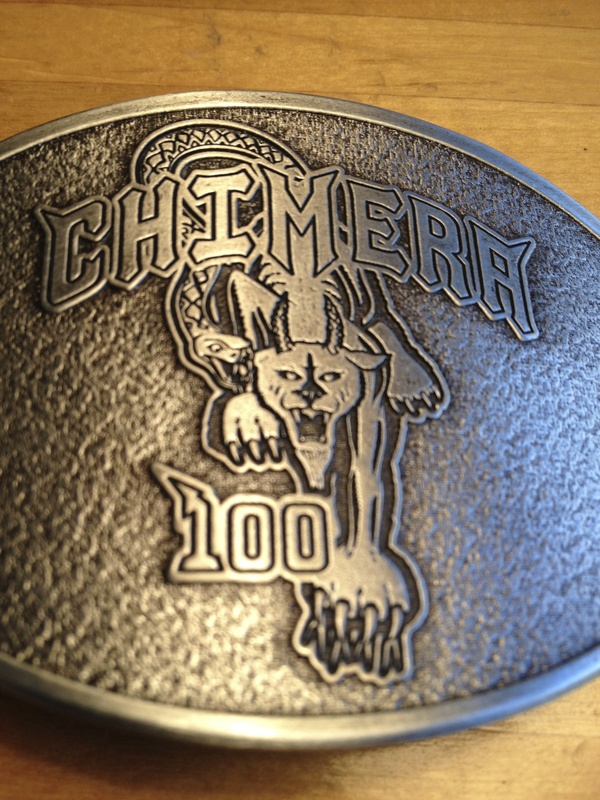 The Chimera 100 Mile races starts and finishes at Blue Jay Campground. The race has over 22,000′ of elevation gain and is rated one of the toughest trail races in the Country. We arrived at Blue Jay Campground in the early hours of the morning when it was dark, cool, and the sky was filled with stars. 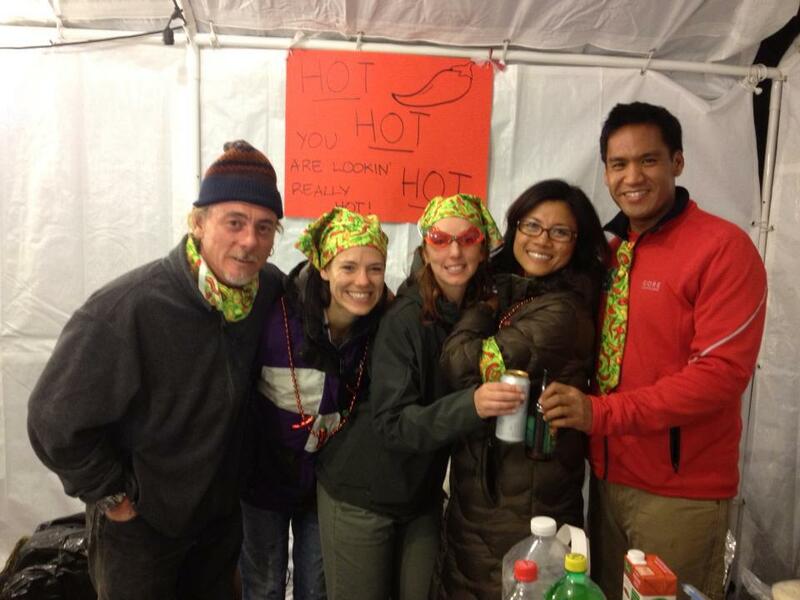 Everyone was huddled near the starting line tent where old friends said hello, breakfast and hot beverages were being served, and bibs were handed out to < 200 runners doing the 100K and 100M races. The race director had us wait until there was enough light for us to take off without our headlamps. Upon his command we took off at a pedestrian pace up the main road. Unlike the typical marathon where I am towards the front of the pack, I held back and talked with some fellow runners. We were all taking it easy since we knew we had a long day (and night) ahead of us. Before any race I do, whether it’s a 5k or a marathon, I almost always need to run at least 3 miles before the start. This is part of my ritual to help me prevent the undesirable bio-break during the race. As someone who suffers from Ulcerative Colitis, this is an important part of my pre-race routine that also includes my need to take my medication and being careful about what I eat. As a result, my GI system was one of the biggest concerns I had as prepared for this race. I decided that I didn’t need to run any extra miles before this race and I would have to make a stop in nature at some point. Well it happened less than a mile into the race. Mother-nature called as expected and I fortunately knew a restroom was right around the corner (and there weren’t many). While this would be the first of 3 stops, my fears that my stomach and GI would be an issue were not a factor throughout the entire race. After my pit stop, the group converged onto what would be a 20-mile loop made up primarily of single-track rocky trail. As a result of my stop, I was much further back than I had even planned but remained calm and patient. If I had been betting against myself, I would have never imagined I could have been this patient this early on. Despite some of my fellow runners asking if I’d like to pass, I waited and had some great conversations with experienced runners who were from the area and had numerous 100’s under their belt. I continually reminded myself that my ultimate goal was to finish and given these runners track records, I was in good company. Inevitably other people needed to make pit stops or stop to take off clothes as the temperature climbed. Within 5 miles, I found myself running in front since a large gap had opened up between the pack I was running with and the group ahead. One of the challenges I found being in front was to keep my eyes on the very rocky course while also wanting to catch glimpses of the incredible views that included seeing the clouds below me. I enjoyed leading this small pack and never thought I would be leading the race. However, I did have some naïve thoughts that finishing in the top 10 might be a possibility. This was until I had the leaders go by me. While this was expected, I couldn’t believe these professionals were probably already an hour ahead of me. This would be the first of many times I would be humbled into realizing this wasn’t a road marathon. I ran into the 2nd aid station (A/S) at mile 10 and saw the Goat. He told me he couldn’t find my extra pair of shorts that I had asked him to look for. Within a few minutes before the start, I had tied my shorts string too tight and it snapped. Although I didn’t think it would bother me, the shorts had been sliding down and aggravating me. Once the Goat told me he didn’t see them (they were in my suitcase in the hotel), I improvised and folded the elastic from my compression shorts over to hold my outer pair up for the remainder of the race. I rushed a little too much at the Candy Store A/S and grabbed a quarter of a PB&J. This turned out to be fine and along with bananas, was the only food I’d touch for over 15 hours. My fueling strategy included taking 1 to 2 Heat Guard pills (Sodium/potassium) every 30 minutes on the hour with 1 gel every 30 minutes on the quarter past/to the hour. This combined with the regular water kept me from bonking. 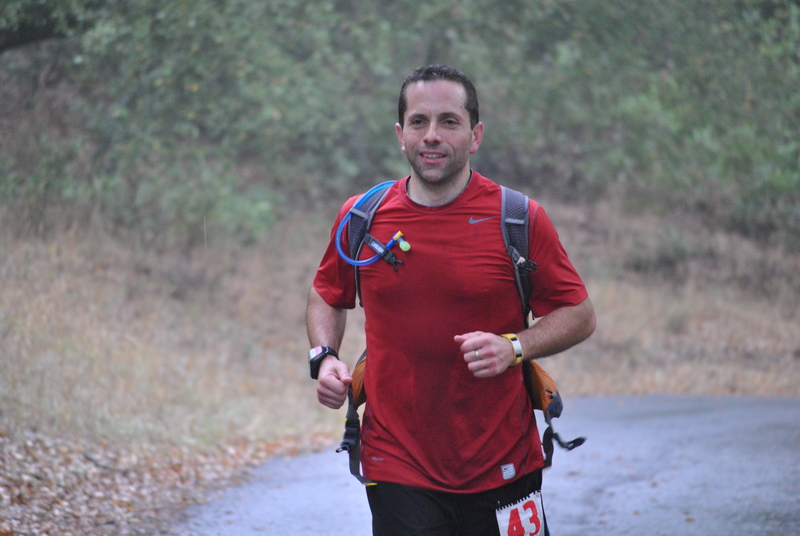 Somewhere around mile 17 I encountered my second biggest fear…Getting lost!! It was too early to have this happen but fortunately I wasn’t alone. I ran up on 2 runners who were trying to decide which fork to take in the trail that didn’t appeared marked. After a quick assessment of the choices, I (the guy from the Bronx) made the logical decision to follow the one which appeared to have more tracks. This made sense but unfortunately it took us over a mile to see the next marker (a white and red ribbon tied to branches). These were supposed to be much more frequently dispersed through the course (especially at intersections) and were for the most part with a few exceptions. Mile 33 occurred at one of the lowest elevation points of the race. 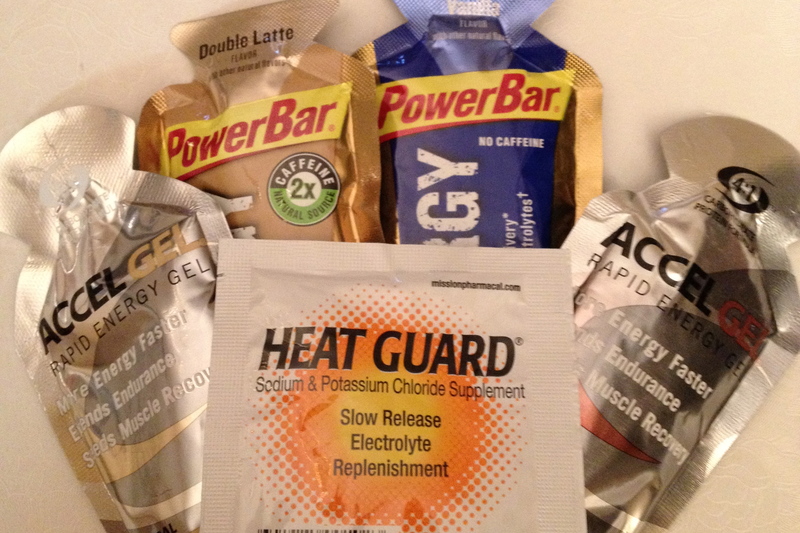 The Goat was there for our 3rd encounter and he provided me with some more gels and some positive reinforcement. However, I told him I was humbled and accepted that 24 hours was not realistic. 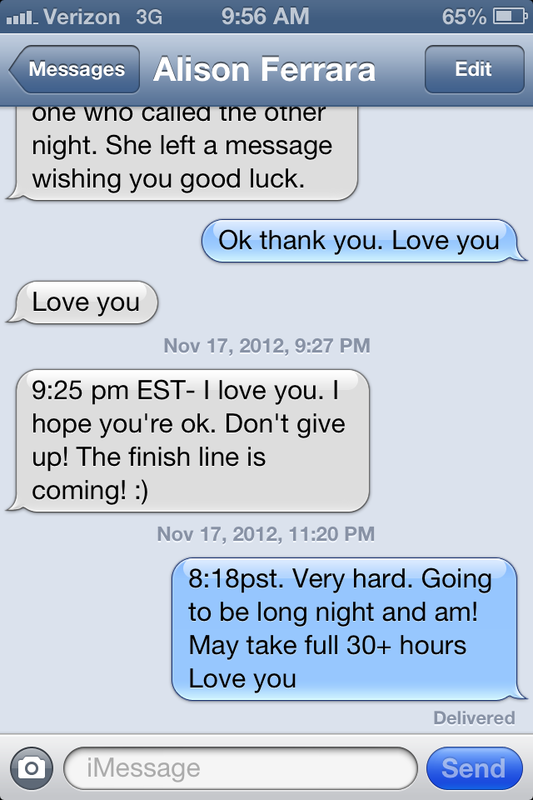 At that point, I still believed 26-28 hours was within my limits … a feeling that would become more challenging. 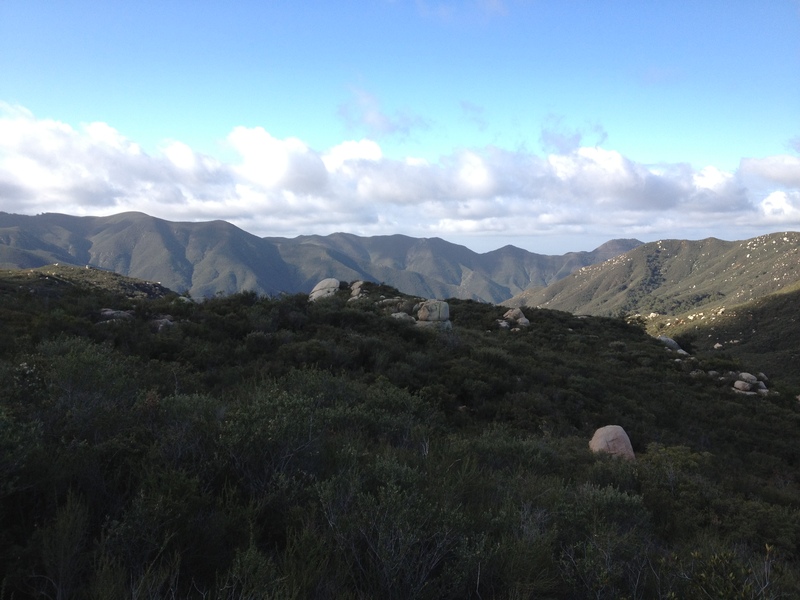 The climb to Santiago Peak at 6000’ was beautiful and challenging all in one. I went back and forth passing Tiffany, one of the veterans in the field who eventual finished in just over 24 hours on the ascent. I had no problem getting “chicked” by her as it had been happening most of the day. I just wanted to get to the top and at least she could tell me how much further I had. 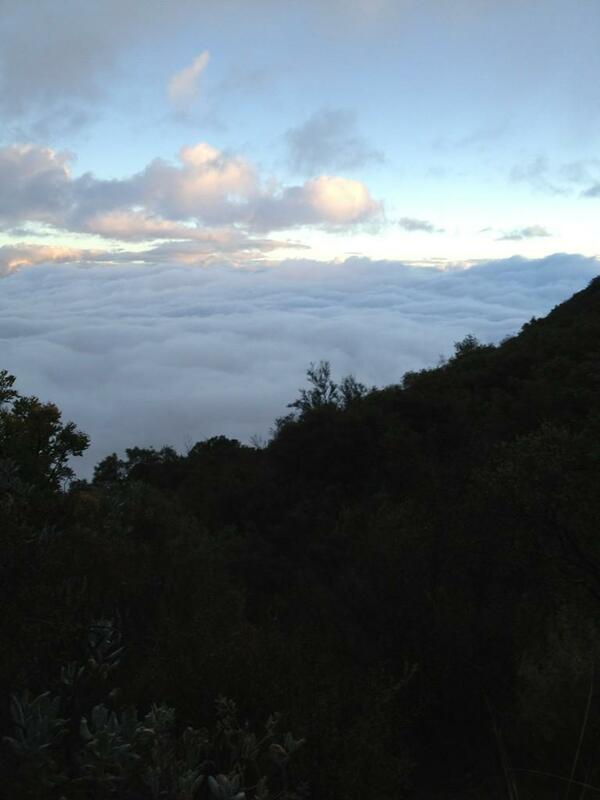 I would climb to this elevation twice, and despite the clouds that would sometime envelop me, the views were still amazing during the day and night. It got cold at the top of the mountain and I didn’t have my gortex jacket with me which I would get in my drop bag at the Maple Springs A/S (mile 49). The cold and darkness, which was quickly closing in, motivated me to go faster. However my legs were screaming and once again I got passed by the leaders… Ouch! I cheered them on, being in awe of their ability and frustrated by my lack thereof. 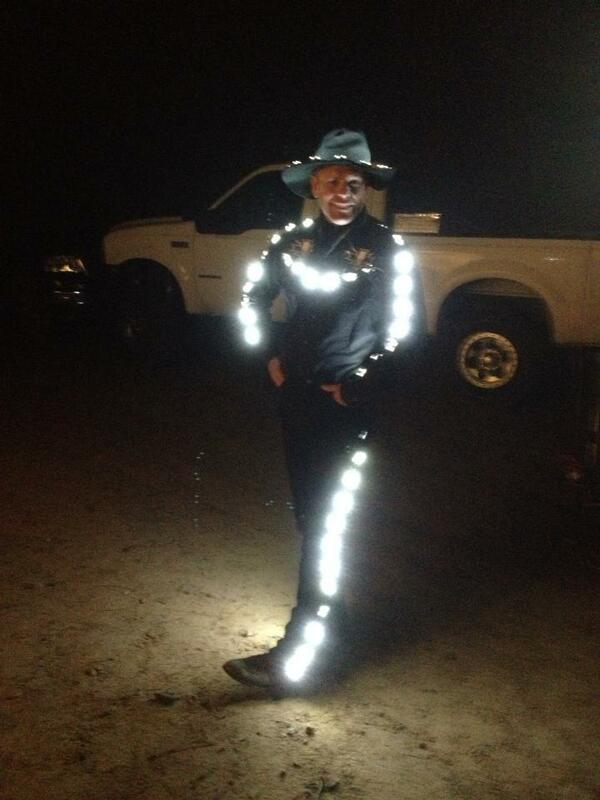 At Maple Springs I changed my shirt, got my jacket and prepared for the dark and cold. Maple Springs was a major A/S with heat lamps, chairs, and an amazing menu to choose from. It was the only place where we left our drop bags and I would come through there again at mile 65. This aid station, like all the others, had incredible volunteers who offered to help you any way they could from serving you food to filling your water bottles up. It was strange to have people so willing to help you in these circumstances but that is why the ultra community is SO SPECIAL! The people you meet on the trails and in the A/S are wonderful people who share a love of running and the outdoors in a way that those who only run on the road often miss out on. Upon leaving Maple Springs, I turned on my 2 headlamps and held one in my hand. I knew it is normal to run slower when it is dark but I had hoped with more light, I could keep my pace up on the 4000’ drop over 6 miles. Unfortunately I didn’t see what challenges might lay ahead. In addition to a constant cold wet mist, the fog made visibility to only a few feet and this slowed me down considerably. While it was good for me physically, psychologically I was getting tired and the inability to see far ahead was really messing with my mind. I had expected to see the Goat at the Silverado A/S (mile 56) before heading back up the mountain to Santiago peak. The Goat wasn’t there and we discussed that this was a challenging A/S to get to so I wasn’t surprised. However, I was tired and despite the positive reinforcement by the volunteers, I was not looking forward to going back up after running for over 13 hours at that point. Little did I know the first 3.5 miles would be straight up a challenging single track path. This is where is happened…This is where the darkness came! I had expected it and even looked forward to it in a sick kind of way. Unlike my previous climbs where I tried to power walk up, I was just trying to place one foot in front of the other while making sure it landed on the path and not off a ledge where the drops were probably a few hundred feet if not more. This, combined with being physically exhausted, broke me. I began to calculate how slow I could walk for the remaining +40 miles and still make the 34 hour cut off. I was tired and just wanted to take a nap. While this helped earlier on, I was struggling. As I came toward the top of the climb, my cell phone finally chirped. I had had reception in and out throughout the day and fortunately my Mophie battery pack lasted the entire race. I looked down and saw that I had received a text from Alison telling me that she loved me and to not give up. I responded that it was hard and was likely going to take me over 30 hours. 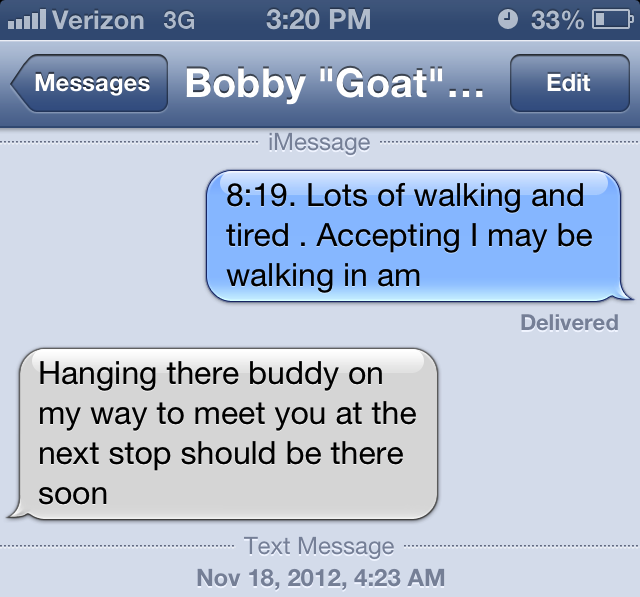 I also texted the Goat and told him I may be walking in the morning. The interesting piece was I never consider quitting and I only worried how slow I could I go and still finish. This was a mindset I drilled into my head months before the race on training runs. I thought of my family and countless friends from Doylestown Presbyterian Church, Doylestown Christian Runners, from work and others who all believed in me. I continued to hike at this point and tried to run when I was on level ground as uphill’s killed my hamstrings and downhill’s shredded my quads. Eventually I made it back to Maple Springs (mile 65) where I had a change of clothes and went off my planned diet for the first time, indulging in some delicious chicken noodle soup. If felt great to have something warm in my stomach on that cold wet night. Fortunately this didn’t bother me and I requested this at every aid station from that point forward. My departure from Maple Spring A/S occurred much quicker than I had expected. This was due to my own realization that despite the incredible volunteers, many of my fellow runners were dropping out in groups. I had run with some of them earlier in the day and I knew they were veterans of this distance. This was not good for me so I packed back up after a very quick change and took off again sometime before midnight. One of the strategies I tried to use at this point as Sunday morning quickly approached was to turn on my music using one headphone. I am not a fan of listening to music while I run and I strongly believe the greatest benefits, both spiritually and physically, come when you focus and listen to your body and the surrounding environment. However at this point it was about staying awake and trying to use the music to keep me moving. Before the music, I first listened to voicemail messages Alison and each one of my kids had left me that were very helpful and uplifting. 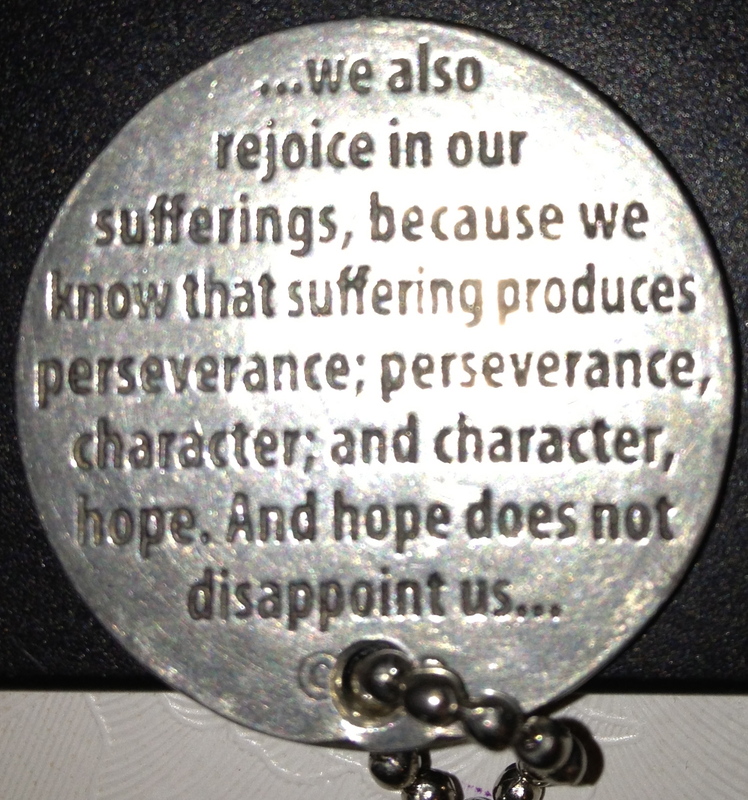 After that I tried some of my favorite Christian songs for the inspiration they often provided me. However I am embarrassed to admit that my Christian music wasn’t helping me. With the exception of one Christian rock band called POD, I had prepared a play list that included Ozzy Ozbourne, Linkin Park, Led Zepplin, and Guns N’ Roses to name a few. All I can say is that it helped me get through the next few A/S stations and I hope the Lord won’t be offended! After exchanging texts with the Goat at around mile 65, I had hoped he might be considering joining me at the mile 82 A/S which is where the next crew/pacer location was. As I left Upper Holy Jim A/S, the Goat called me and told me he would meet me at the next Aid station (mile 75) and go with me for the remaining 25 miles. I was excited! As I ran into the Indian Truck Trail Aid Station (ITT A/S), the Goat had made lots of friends with this awesome staff of volunteers. Trasie was one of the A/S captains at ITT and tried to feed me pumpkin bread, vegan butternut squash soup, quesadilla’s and an assortment of delicious sounding foods. However I stuck with chicken noodle soup and PB&J. I was fortunate that the Goat had planned ahead and registered as a pacer the day before in case I desperately needed his help. It turned out I did and his timing was perfect given those next 7 miles were on an out and back road that dropped 3000’ feet…only to turn around and climb back up it. Having the Goat by my side was huge and I tried to take advantage of the downhills by running most of the time. As we got near the next A/S, I picked up the pace and the Goat had fun pushing me past a group of runners. Once we arrived I was concerned about the Goat’s injury given the downhill pounding. He told me he was good so we both refueled and didn’t stay long. I had been running for almost 21 hours at this point and expected to walk the whole way back up to ITT A/S (90 mile). I began to try to walk quickly and run as much as the pain would allow. 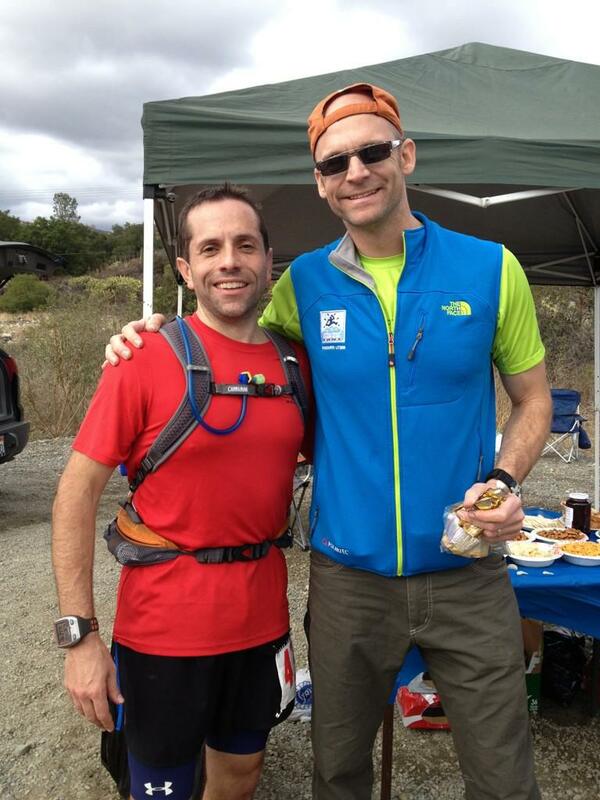 Although I was exhausted and hurting, something happened to my attitude and outlook when we left the aid station. This change began to show itself to the Goat and we ran past a runner and his pacer about a mile after leaving the Corona A/S. I became more competitive as we passed them and I picked up the pace even more to ensure they didn’t try to catch us again. The Goat was very encouraging and impressed that I had that in me. It was painful but I had several things motivating me: I did not want anyone else to pass me, I wanted to get back to the ITT A/S (which should also be timed with the rising of the sun), and I began to realize that if I kept pushing, a sub-30 hour finish was within reach. 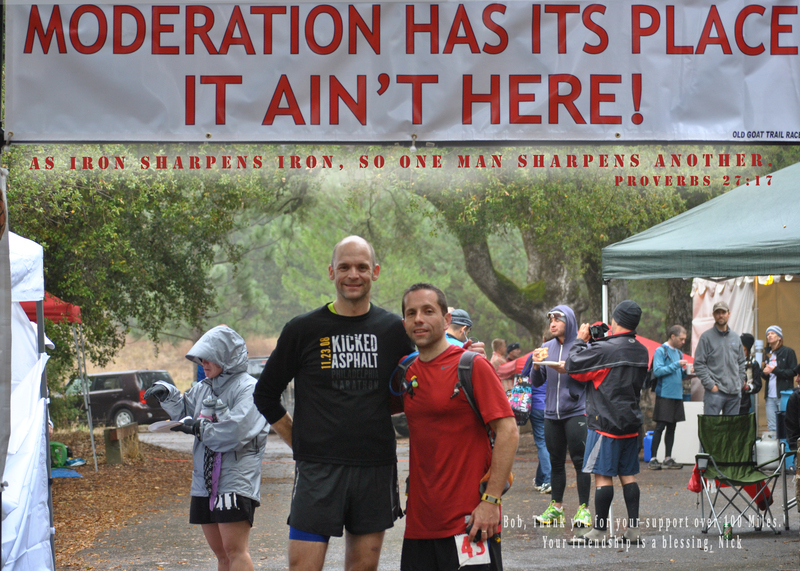 Despite my competitive attitude, another aspect I love about the ultra community is that everyone encourages one another whether you are in the lead, in the back, being passed, or doing the passing. As we continued to walk/run up the road at a surprising pace, the Goat was the ambassador of motivation. Not only for me, but for every runner we encountered. I was in pain and I was glad he was encouraging others. However his loud clapping and shouts of encouragement would start as soon as we would see a headlamp in the distance. It started to go through me and I snapped at him to at least wait until they were closer before clapping. It was the only time my gratefulness of having him with me was tested. We arrived at the ITT A/S to briefly see our new friends and the rising sun. The last 10 miles were supposed to be rolling hills with the last 3 dropping almost 1000’. Unfortunately we would first climb this elevation in just over a mile… OUCH! But despite the pain throughout my body after 90 miles, the sun was up, I had the Goat at my side, and I wanted to get this over with. I was giving it everything I had and the Goat knew it! At the last aid station before the 3 mile decent to the finish, we saw a couple of runners quickly departing as we arrived. After refueling and getting some encouragement that our next stop would be the finish line, we took off. The Goat mentioned to me that we might be able to overtake them and despite my verbal response, “I need to run my own race”, we were on the same page. They had gotten a good start on us but by the time we passed them, they looked like they didn’t have much left. Since meeting up with the Goat, I had passed a bunch of runners and had not been passed. I had gone from hoping to make the 34 hour cut-off to shooting for a sub-30hour finish to now thinking sub 27 hours was possible. Despite the pain and all my previous doubt, those last 3-5 miles were probably some of my fastest ones of the entire 100 miles. I was flying as I hit the road for the last mile into the finish and couldn’t believe it had been over a day ago that I had started on this same road. I had beat the demons, I had broken 27 hours (26 hours, 11 minutes) and earned my first 100 mile buckle that was presented to me by Steve the RD. It was by far the most challenging thing I had ever put my body through yet also the most rewarding. People asked me after I finished if there is anything I would or could have done differently? However I view this experience like my first marathon in that the knowledge comes with experience and that, at times, there is no substitute for actually just doing it! There are so many people to thank! First I must thank the Lord for all of the blessings in my life. I must thank Him for directing my paths and in getting me to this point which I could never have imagined only a couple of years ago! I have to thank Alison and my kids for putting up with me as my training could be challenging at times. While I did my best to run early in the morning so as not to disturb our family life, falling asleep before my older 2 kids at night was the result of those early runs. Obviously I must thank Bobby Goat for all the support during the training and on the course itself. I also have to thank his wife Kimberly and his kids for allowing him to spend time away from them to join me for this run. Bob is a wonderful friend that always brings to mind Proverbs 27:17 “As iron sharpens iron, so one person sharpens another”. Everyone from Doylestown Christian Runners who have been a wonderful blessing in my life. Encouraging me both spiritually and physically as we all strive to use fitness as a means to strengthen our Faith. To my entire family, my friends at Doylestown Presbyterian Church, my neighbors, co-workers, and others for all of your prayers and support. 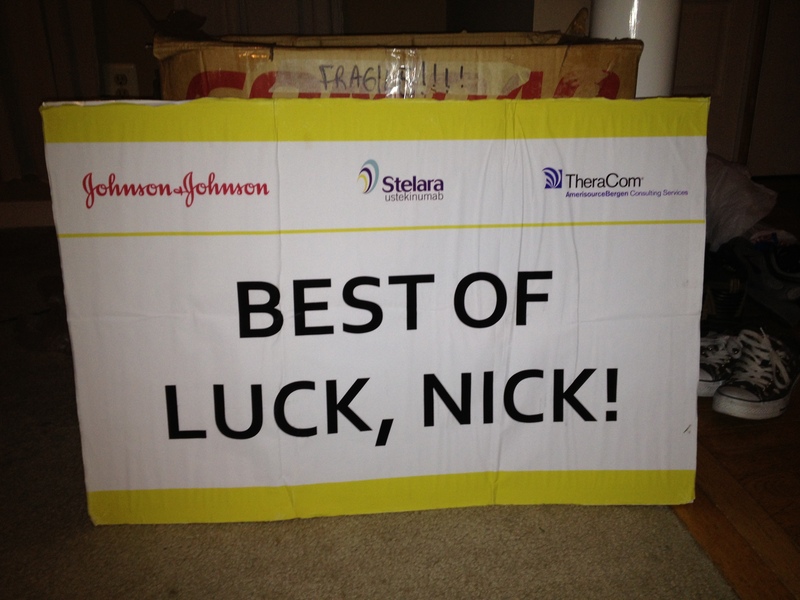 I have to give a special thanks to Bill, Aimee, Marcy, and my friends at Thercom who somehow managed to get a sign at the start of the race wishing me luck. Let me assure you we were in the woods and no FedEx was anywhere close. It was an amazing accomplishment in itself and one that meant a great deal to me. Awesome Story Nick! You are an inspiration for certain! Zwickel, thanks and great to hear from you! Now that you have the Tri under your belt maybe a trail race is next? Talk to you soon. Nick was truly impressive, his closing 25 miles exceeded even the lofty expectations I had for the boy from City Island. Bob, it would have been a very different race if you hadn’t jumped in! Thank you doesn’t do it justice… You made all the difference! Now we just need to figure out what’s next!! THank you so much for the kind words and I greatly appreciate your support leading up to the race. I plan to keep trying to have you join us on a Saturday at some point. Thanks again and hope to see you next month. Nick, congratulations!! Very inspiring story. I’m amazed at your strength both physical and mental to accomplish such a goal. Thanks Monica! It was difficult but I learned a great deal about myself during the race. Congrats on your Marathon as well! Great race report! This makes me want to go run. Stopping in the first mile made me laugh – that always seems to be my luck, too. Your description of looking down on the clouds is awesome. Keep up the great work and race reporting. Thanks for reading the report! It was a race where the amazing views were nicely complimented with the difficult challenges that course presented for me.